A rapacious breed of vampire inundates London under the direction of an African trickster god in this horrorfest set against an urban backdrop. Some smart-alecky graffiti artist is marking London with the creepy message, “Vampire Sharkz: They’re coming to get you,” and bright young writer Ben Ashton’s editor at glossy Click This magazine gives him 11 days to get to the bottom of what seems to be a hot story. His research takes Ben to visit the apparently nutty old African preacher Elmo Kigoma, who’s seated in a boat perched on top of a pole along the Thames. The end of the world is coming, Elmo warns passersby: From his vantage point during the night, he has witnessed raving gangs of savage creatures emerging from the river, attacking bikers and pedestrians at random, sucking their blood greedily, then regurgitating their feast back into the victims, who in turn become vampires. Ben doesn’t believe a word of it . . . until he sees for himself. Elmo tells him the vampires are acting on the mischievous prodding of African trickster god Edshu, who tests humans periodically by pitting them against each other. When Ben hears of the attack on his old friend (and unrequited love) April Connor, who then disappears, he moves into action. He enlists the help of both Elmo and April's fiancé, wealthy shipping scion Trajan, to identify the vampires and locate the island in the Thames where they find shelter. 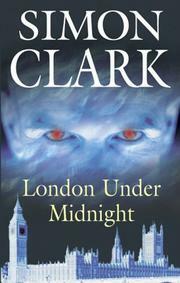 Clark dramatizes April’s ghastly plight on the vampire island; eventually, she and another bloodsucker decide they have to return to London proper and spread the news of the amazing benefits of drinking blood. Descriptions of ripping flesh and dripping liquids become repetitive, though Elmo’s resolution of the vampire crisis through New Age-y visualization techniques is clever, even endearing. Plenty of gore, but pretty routine.